Senior Kevin Malo finds an opening against Lowry. Truckee will head to Moapa Valley on Saturday, Nov. 3, to play in the Class 3A state semifinal round. For the first time since the 2012 season, the Truckee football team will play in a state playoff game. The Wolverines earned a berth into this year’s Class 3A state tournament on Saturday, behind a 42-6 victory at Surprise Stadium against Lowry. “It’s a big deal, especially because the expectations at Truckee have been you always get to state. As head coach of the Wolverines and not being able to get there, it has been a little bit taxing mentally, but we just kept plugging away and we’ve got a very good group of kids,” said Head Coach Josh Ivens. Truckee opened the game on Saturday by scoring on their first four possessions, while defensively, the Wolverines didn’t allow the Buckaroos to get past the 50-yard line until midway through the second quarter. “We knew we had to come out and play hard from the beginning, and set the tone,” said senior Derek Laferriere, who intercepted a pass early in the game, followed by catching a touchdown on the ensuing series to put Truckee up 21-0. Senior Kevin Malo also had a big afternoon for Truckee, burning the Lowry defense early on for a touchdown as part of a team-high 85 receiving yards. “I took an inside step, stuttered a little bit, and I was gone,” said Malo. Malo’s second touchdown came with seconds remaining in the first half. Senior quarterback Marcus Bellon scrambled from the 15-yard line back to the 30, evaded several defenders, and then found Malo in the back corner of the end zone for a 35-6 lead going into halftime. The Wolverines final touchdown came on the opening drive of the second half on a 21-yard screen play to senior Marcus Trotter. Bellon had a spectacular final game at Surprise Stadium. The senior quarterback threw for 303 yards and four touchdowns, and ran for 80 yards and two touchdowns, including a 60-yard scamper to put the Buckaroos in a 28-0 hole. Defensively, Truckee limited Lowry to 55 rushing yards and 105 passing yards, and for the most part, took away the Buckaroos two biggest threats, quarterback Brendan Domire and running back Anthony Peterson. The 2018 season was the first time since 2014 that Lowry reached the postseason. Following Truckee’s win against Lowry, many of the team’s senior players gathered up at midfield to soak in their final moments at Surprise Stadium as Truckee football players. The field has been home to both pain and joy for a senior class that has spilled blood, sweat, and tears, all the while living up to the high standard of Truckee football. “We’ve all been together since we were little kids running around,” said Malo. When Truckee takes the field Saturday, Nov. 10, in Moapa Valley, it will be the team’s first state tournament playoff game since legendary Coach Bob Shaffer guided the Wolverines to the state title in 2012. “I’ve been dreaming of this since I was a little kid, and now it’s coming true,” said Laferriere. 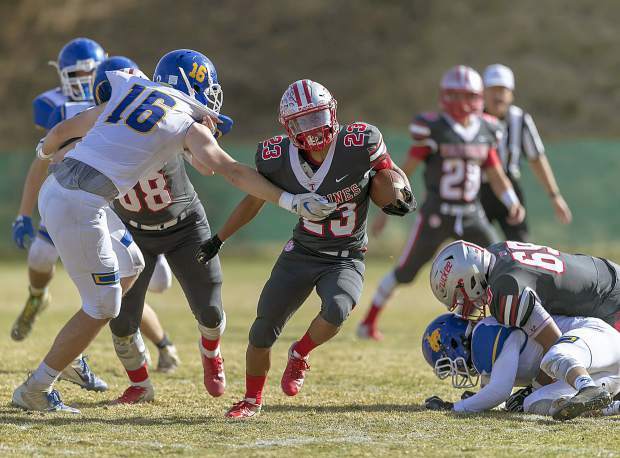 Truckee will square off against a team in the Class 3A semifinals that has lined up opposite the Wolverines several times in past years with state titles on the line — Moapa Valley. The Pirates went 10-1 this season and hammered Cheyenne 42-19 in the Southern League semifinal round. Truckee and Moapa Valley last played in 2012, when the Wolverines won 34-10 to capture the state championship. The teams also met from 2008-11 to decide the state title. Moapa Valley won in 2008, and the Wolverines captured the other three titles as part of a run of four straight championships.